I have helped out at Canine Therapies for a number of years and have swum my own dogs in order to keep them in peak fitness for the show ring. It has certainly made a difference, as can be seen in the many judges’ critiques which almost always mention the excellent movement from well-toned muscle in such a small breed. I have lived with a variety of dogs all my life and at the age of 13 I was allowed to choose one for myself. I fell in love with Bichons (although sometimes I have regretted all the grooming they entail, particularly as I show them!) I now have a house-full ranging from 15 years down to my young puppy and also a Mexican Hairless. I have recently started Agility classes with my youngsters and really enjoy competing with them. I have to train my dogs in different ways as one is so fast that she has to learn distance control – I just can’t keep up! I have also shown all my dogs over the years, and regularly qualified for Crufts. Being made redundant from my previous job allowed me to fulfil a dream and work with dogs full time. 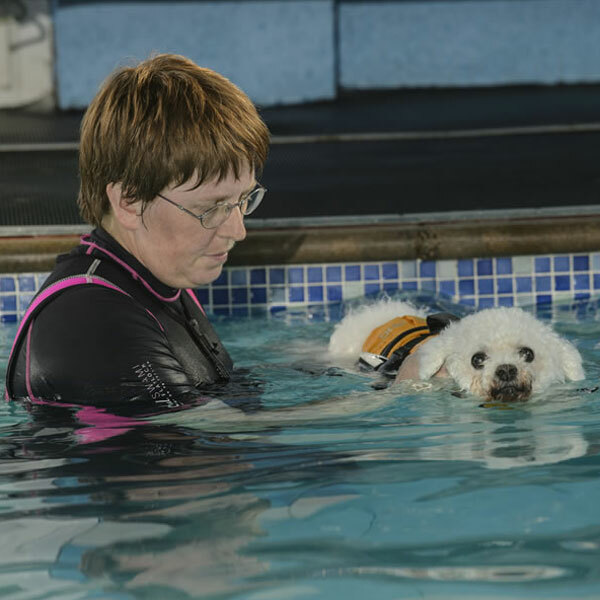 I qualified as Canine Hydrotherapist in September 2012 and hope to further my knowledge by following a Canine Massage course. It is proving to be very challenging and I look forward to the practical weekends which begin in the next few months.